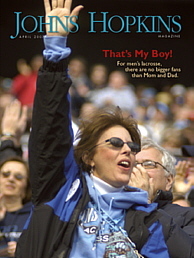 For Johns Hopkins men's lacrosse, there are no bigger fans than Mom and Dad. Meet the diehard parents for whom Saturday — no matter what — is game day. English professor Richard Halpern has spent a lot of time studying Norman Rockwell's work. Think it's the epitome of innocence? Think again. Allison Okamura and her team at the Haptics Exploration Lab want to give robots a sense of touch. Their work may make some surgery faster and safer. Whether treating patients or treating audiences to a great show, psychiatrist and jazz musician Denny Zeitlin, Med '64, is looking for a deep connection. The Big Question: Will University Presses Survive Open Access?